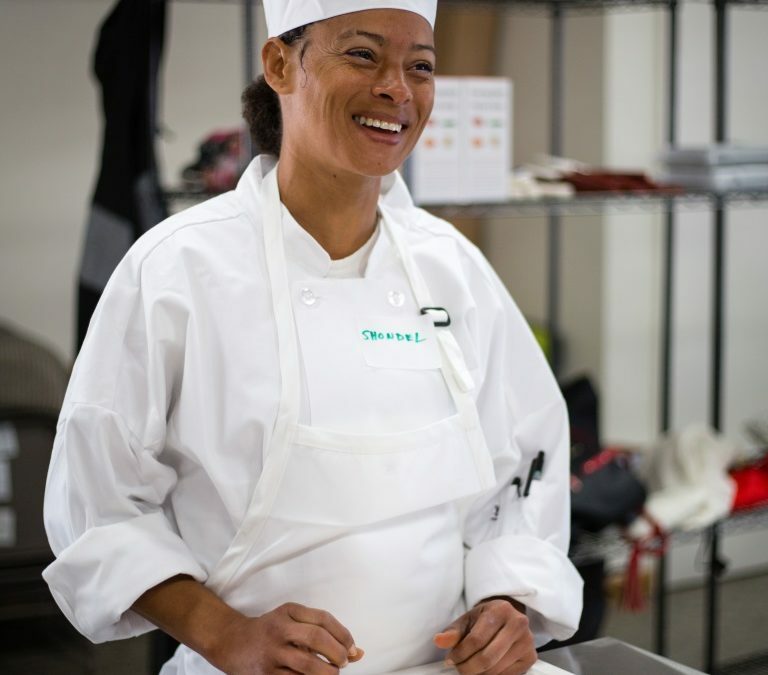 Shondel Bryant’s face lights up the minute she walks into the United Domestic Worker’s (UDW) kitchen. She applied for – and was chosen – to do the B5 Foundation Culinary Arts Academy Program (CAAP), and she’s loving it! Cooking is not only Shondel’s passion, it’s been a big part of her life. You may wonder why, with all of this experience behind her, she would want to do this course? Shondel and the other students are four months into the CAAP course (held one weekend a month over seven months). They’re learning a variety of culinary skills including braising, creating classical sauces, fancy French knife skills, the art of making wicked potato bread and more. They’ve also prepared a host of different dishes from around the world – a highlight being Persian chicken laced with lemon, walnuts, pomegranate molasses, and the all-important aromatic herbs and spices. In March, a Moroccan feast drew more than 60 members of the community, plus a number of dignitaries, to the UDW to enjoy the best of Middle Eastern cuisine. “This course really keeps me on my toes,” laughs Shondel. “I love learning the French techniques. After the braising lesson, I braised everything I cooked! I’ve also been experimenting with the different sauces we’ve been learning. A single Mom of a boy and a girl, Shondel offers in-home support, cooking meals for two clients. “Now I’m cooking these meals for my clients and they’re loving it,” she says.